Imagine Music Festival, sponsors of the wildly popular Silent Disco at CounterPoint last weekend, teased fans by announcing the first few artists slated to appear at Imagine's second edition. The cat is completely out of the bag now, as Imagine released its entire Phase 1 lineup Tuesday afternoon. Sharing the stage with popular acts like Lil Jon, Dada Life, and GRiZ are buzz-worthy talent such as 12th Planet, Brillz, The Crystal Method, Shpongle, a Pretty Lights Music (PLM) Record Label showcase with Paul Basic and Eliot Lipp, G Jones, plus noteworthy live sets from Papadosio, brand new live project featuring Ill Gates with KJ Sawka on the drums, and Zoogma. 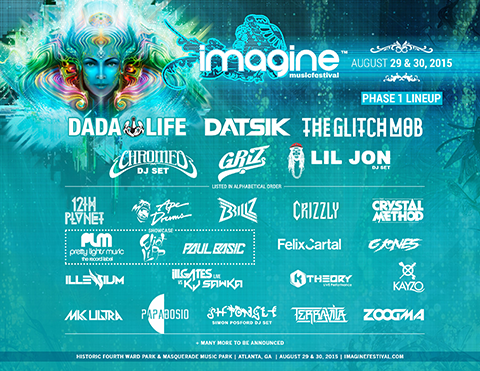 Imagine Music Festival, which welcomed more than 15,000 people to Atlanta's Historic Fourth Ward Park in 2015, is scheduled to close out the summer festival season on 29 August 2015 and 30 August 2015. “We can’t wait to show our fans what we have up our sleeve,” says festival producer Glenn Goodhand. “We set the bar extremely high last year, but we are confident this year’s lineup will exceed all expectations and set a new standard. General admission tickets are currently priced at an affordable $99 for the entire weekend with VIP at $229 before service fees. Prices will increase as allotments run out. VIP amenities will feature private exclusive viewing areas, front row pit access, private bathrooms, bottle service and much more. Tickets to the 2015 Imagine Music Festival can be purchased at www.imaginefestival.com.